PRO PLAN OPTIDERMA Salmon Sensitive Skin Large Breed Athletic Adult Dog is sure to keep tails wagging! Some dogs have a tendency to itch and scratch more than others. And they may experience more dandruff. 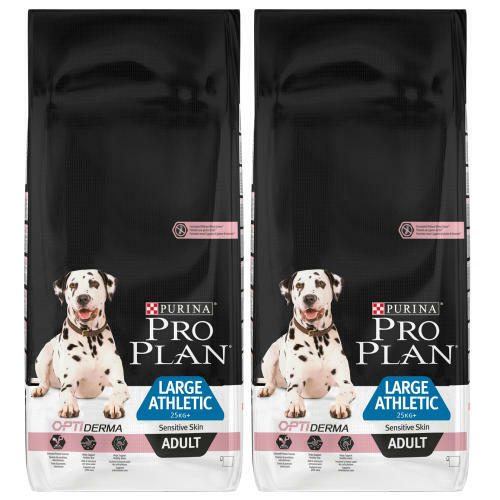 Developed by our vets and nutritionists, PURINA PRO PLAN with OPTIDERMA is formulated without gluten and provides advanced nutrition that supports the sensitive skin of adult large dogs with athletic physique. OPTIDERMA includes a special combination of skin targeting nutrients proven to support healthy skin and beautiful coat and selected sources of protein to help reduce possible skin reactions associated with food sensitivity.